Identification: Sciurus carolinensis is a medium sized tree squirrel (8 to 10 inches long with a bushy, 6 to 8 inch long tail, weighing 500 to 600 grams). There is no difference in size or coloration between males and females. Coloration ranges from dark to pale grey body with white to pale grey underbelly and tail. More black-coated Grey Squirrels occur in the north. Grey Squirrels are highly adapted for climbing trees – they have tough curved claws, and the ability to reverse their hind foot 180 degrees to permit headfirst descent. Gray squirrels are excellent climbers and can leap considerable distances using powerful hind limbs. Tails are used for balance when running and leaping between trees, and held over the back of a resting animal. Original Distribution: Sciurus carolinensis originally ranged only over the eastern USA to just west of the Mississippi and north to Canada. Current Distribution: Eastern USA, England, Ireland, Northern Italy, South Africa, and Western Canada. Site, Date and Mode of Introduction: Sciurus carolinensis first appeared in the English countryside between 1876 and 1929 having been accidentally released from the London Zoo. The introduction of “Scioattolo Grigio” to Northern Italy also occurred in the late 19th century when they were imported as pets from America. 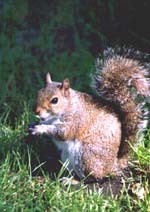 Reason(s) why it has become established: In England, Ireland and Italy, the American Grey Squirrel quickly adapted to the native forests of the countryside. The Grey Squirrel is larger and more aggressive than its European cousin, the Red Squirrel (Sciurus vulgaris), which is about half the size of the Grey at 250 to 400 grams. The larger Grey Squirrel survives cold winters better than its thin cousin, as it is able to store more fat. Taking advantage of its size by foraging in the trees as well as on the ground, the Grey Squirrel out competes the smaller Red, who stays in the trees to avoid predation. Grey squirrels are generalist feeders, while the Red Squirrel prefers conifer forests. The adaptable Grey feeds on nuts, flowers, fruits, seeds, tree bark, fungi as well as bird eggs, nestlings and frogs. Ecological Role: As a generalist feeder, the American Grey Squirrel is able to easily adapt to European forests where it is out competing the native Red Squirrel. The distribution of Red Squirrels has declined drastically in the last 60 years and they are now extinct in southern England except for a few on the Isle of Wight. Red Squirrels are still widespread in the North of England and Scotland, but even here their range is contracting. In Italy, the Scioattolo Grigio has out competed the Scioattolo Rosso in Piedmont and Turin. The damage to trees in England is estimated at 2 million British pounds per year. Benefit(s): Originally a primary source of food for Native Americans and Colonists, the Grey Squirrel is still eaten by some people today. In Mississippi, Squirrel hunting and trapping brings in 12.5 million dollars annually. In general, squirrels are ranked second to birds in value to nature watchers. Threat(s): In Europe, Sciurus carolinensis is considered extremely destructive to native trees and the only native squirrel species, Sciurus vulgaris. The Grey Squirrel has made it to the Invasive Species Specialist Group of the World Conservation Union’s list of “100 of the World’s Worst Invasive Alien Species.” British and Italian environmental groups have ranked the Grey Squirrel as second in negative impact only to the Norway rat (Rattus norvegicus). Evidence is inconclusive, but the Grey Squirrel appears to be a carrier of the parapoxvirus, which is deadly to the red squirrel, but seemingly harmless to the Grey. The most damaging food item enjoyed by the Grey Squirrel is tree bark. In winter when food is scarce, the Grey Squirrel can strip maples, pines, hemlocks and others of their protective bark, leaving the tree vulnerable to disease. Control Level Diagnosis: High – due to the potential increase in population size and distribution throughout Europe. Currently the Grey Squirrel is limited to England, Scotland, Ireland and Northern Italy, but could easily move into France, Spain, Germany and Eastern European countries without difficulty. Control Method: In Italy, the government offers rewards for Grey Squirrel tails. However, elimination of individuals will not ensure control of the prolific Grey Squirrel. Planting more conifer trees is one method to favor Red Squirrels over Greys, although it appears that the Greys will adapt to most forest situations. Special food hoppers, which allow feeding by the lighter Red squirrel but not the Grey squirrel, can help to tip the balance in favor of red squirrels. Finally, captive breeding of Red Squirrels might help the re-introduction of the Reds to areas where the Greys are not as prevalent. Most environmentalists agree that Red Squirrels should not be re-introduced to areas dominated by the Grey Squirrel, as they will likely fail.